ACS is pleased to distribute “The Behavior of Supreme Court Justices When Their Behavior Counts the Most” by Geoffrey R. Stone, Edward H. Levi Distinguished Service Professor of Law at The University of Chicago. 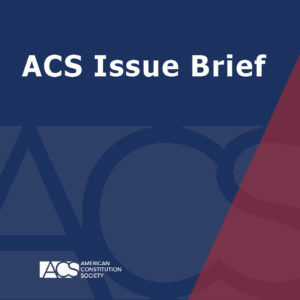 In this Issue Brief, Stone examines the votes of 13 Supreme Court Justices in 20 important constitutional cases since 2000 to compare the differences between liberal and conservative approaches to constitutional interpretation. While liberals have often been associated with judicial activism and conservatives have rhetorically embraced judicial restraint, Stone argues that the Court’s “most important recent constitutional decisions” belie this “traditional understanding of how liberal and conservative justices behave.” Stone argues instead that the moderately liberal justices employ a method of “selective judicial activism  deeply rooted in the original understanding of the essential purpose of judicial review in our system of constitutional governance” and reflective of the Court’s famous footnote 4 in United States v. Carolene Products Co. The conservative justices, on the other hand, while “articulat[ing] two quite different theories of constitutional interpretation,” judicial restraint and originalism, are unable to demonstrate any consistent interpretive theory capable of explaining their votes in important constitutional decisions. Stone concludes that the moderately liberal justices apply an approach in line with “the original concerns of the Framers of the Constitution and in their distinctive understanding of the special responsibility of courts in our constitutional system,” while the Court’s conservatives’ “votes cannot be explained by any consistent theory of constitutional interpretation” but are instead driven by their own policy preferences.